The good news: If you liked Windows 8, its first major update is going fix a ton of the little things that bothered you. 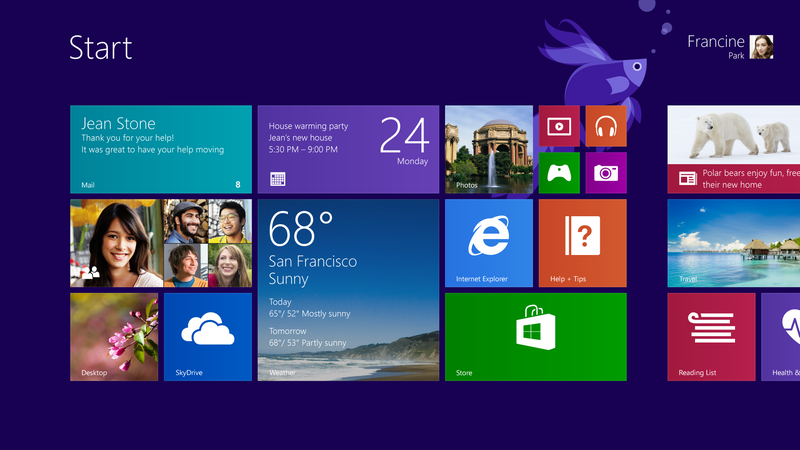 The bad news: You might not like Windows 8. And there's nothing here that will change that. At least there's a Start button! Missed you, friend! It won't always be immediately visible in whatever app you're using, but you're never more than a mouse-over away from the Start screen. It's not quite the robust Start menu people were clamoring for, but it's... uh... a start. Another win for die-hards: You can boot directly into desktop mode now. So long, flat design! Or, if you prefer a best-of-both-worlds approach, you can display your tiles over the traditional desktop background. Baby steps. The Start button (rightly) is going to garner the most attention, but Windows 8.1 also features a bevy of smaller tweaks that let you better configure your PC to your needs. Much of this is aesthetic; you've got more control over your Start screen background, make your Lock screen a slideshow of pictures if you want to turn Surface into the world's most expensive digital picture frame, and uninstall, resize, or move apps in groups instead of one at a time. There's less presumption in Windows 8.1, too. New apps don't automatically wind up on your Start screen; they instead get shimmied off to an apps view, from which you can choose where and how to pin it. Likewise, you can now open photos from Mail, SkyDrive, or the Camera app to edit them. Microsoft's also using Windows 8.1 to give SkyDrive a major boost; it's more deeply integrated than ever before, storing all of your settings and apps automatically to make switching from PC to PC a seamless experience. You can also save individual files directly to SkyDrive from Windows 8.1, while accessing any of your cloud-based docs from the SkyDrive app, even when offline. SkyDrive may not get as much hype as the iClouds and Google Drives of the world, but it's a terrific service that deserves the spotlight. It's also, incidentally, Microsoft's key to being a fully integrated—and standalone—ecosystem. Bing is not perfect. In fact, by many measures, it's not even particularly good. But it's going to be everywhere in Windows 8.1, and that may not be the worst thing. By default, the Search charm will provide a global search that spans both the web and your SkyDrive files, apps, and suggested courses of action, all powered by the anti-Google. Sounds great in theory, and Bing can only get better as more people use it to feed its algorithms. But for much of the Windows 8.1 search experience, you won't have Google as an option. That's going to be problematic for some. The most exciting thing about Windows 8.1 is that it's a clear indication that Microsoft is pushing forward with Metro, not pulling away. Yes, the Start button is a (probably necessary) concession. But it's the only one. None of the rest of these changes give even the slightest whiff of retreat. Good for them. We'll be able to get a closer look at Windows 8.1's features starting on June 26th; it'll be available as a free update later this year for existing Windows users. Which gives you plenty of time to get comfy with the idea that those tiles aren't going anywhere any time soon. Nor should they.